A new paper by groundbreaking inequality researcher Raj Chetty is set to change the way we think about health outcomes for Americans living in different parts of the country. 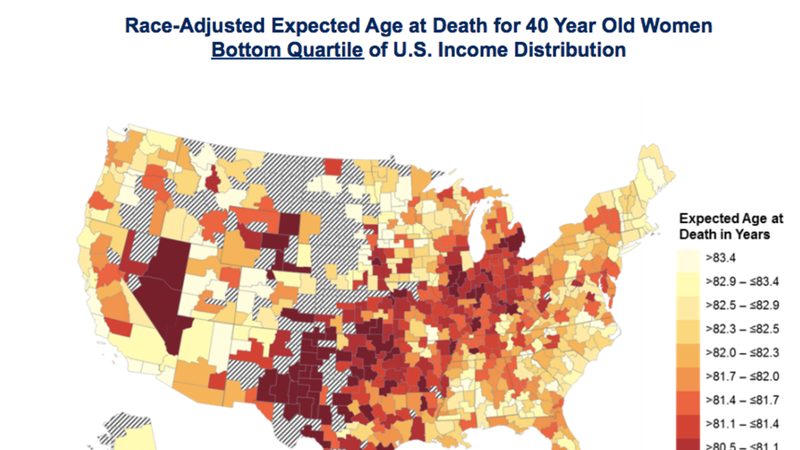 In "The Association Between Income and Life Expectancy in the United States, 2001-2014," Chetty and his team pinpoint the factors that lead to dramatically different health outcomes for rich and poor Americans living in different types of geographies and socioeconomic settings. The best accounting of the paper's findings was done on Twitter by Atul Gawande, a practicing neurosurgeon and a staff writer for the New Yorker. We've annotated his Tweets about the paper below, using slides from a website Chetty and his team put together about the paper. "Men in the bottom 1% of the income distribution at the age of 40 years in the United States have life expectancies similar to the mean life expectancy for 40-year-old men in Sudan and Pakistan," Chetty et. al. write. Here's what this looks like in chart form. The "P"'s equal income percentiles. And for women, where lifespans between income quartiles (represented by the different colored lines) are diverging at an even faster clip. All rich families are basically equally healthy. But not all poor families are so. A poor person in New York has a much higher life expectancy than a poor person in Detroit. We'll learn why below. Here's the full table of correlations for low-income individuals. Immigrants, high home values, population density…it looks a lot like New York. Basically, if you're poor, you'll still have better health outcomes in cities that are overall better educated and more diverse than if you're poor and lover somewhere that isn't. A positive tick mark indicates a stronger correlation. There is indeed much more to dig into here. But Chetty and his team are going to be the ones everyone will follow into this field going forward.